Boo Knits! : FLORENTINE - Time for Something Cosy! FLORENTINE - Time for Something Cosy! As the temperatures are erratic still and spring has not totally sprung there is still time to knit a big cuddle of a shawl for those chilly evenings when you don't quite want to go back inside yet. Here is Florentine, the fourth pattern in the Boos for Beginners Collection. This collection consists of a series of six patterns designed for those wishing to try shawl patterns. Each pattern will still be a very useful addition to any wardrobe - whether beginner or not! Not all Boo Shawls are lace in the same way that not all cocktails or alcoholic drinks are over ice – or even cold! A Café Florentine is a warm coffee incorporating three different and distinct flavours (see recipe on final page of the pattern). 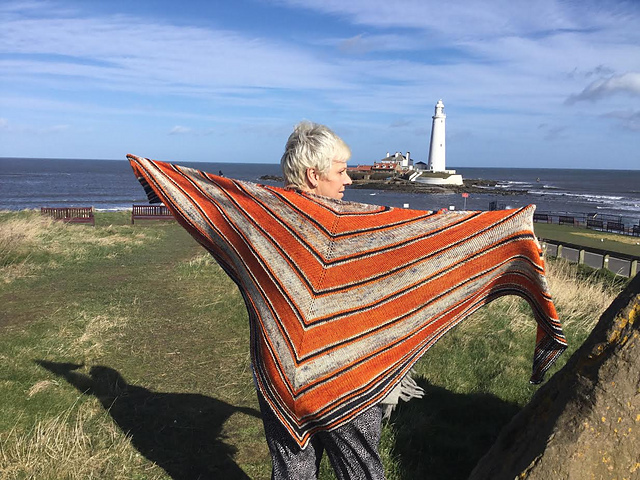 Echoing this, Florentine is a warm hug of a shawl incorporating three different and distinct colours worked in stripes; the perfect shawl to be shared for a cuddle up together, worn for winter walks, for lying on to stargaze, to wrap up in to feel the closeness of someone when they are not there or even just worn because you love it. The addictive repeats of stocking stitch bordered by garter ridges and colour changes make the shawl interesting to knit and the double knitting weight of yarn makes it a quick knit that is both beginner friendly and one that makes the heart happy. This shawl used three different colours, I used two balls of each colour in Toft DK Wool (225m/100g) for my shawl though only broke into the second ball of Yarn C for the bind off. The shawl is written as a one size shawl but is easily adapted to be enlarged or reduced.